Sunday, June 2, departing at 7:30am (7:00am from the subway). Cost: ¥380 / ¥340 for members; Difficulty Level 3+. In Brief: Make the big climb up to Yinmeng Temple, and then hike down the other side of the mountains to explore the Sujia River. Finish with a slightly smaller climb to get back on to the Beijing city side of the mountains. Awesome views of mountains, cliffs, canyons, and the river. Hiking toward craggy peaks in the Yudu Mountains. 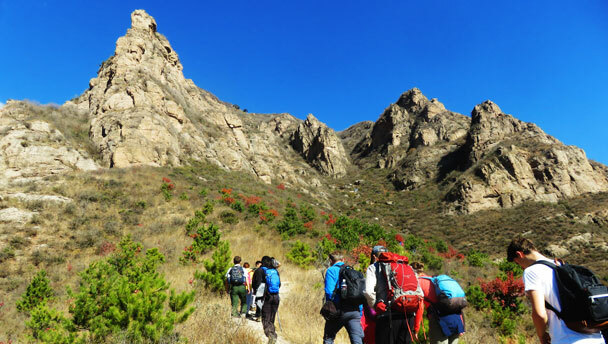 On this hike we make a big climb up and over the Yudu Mountains to get into the Sujia River valley. After a hike down the river, we make another climb out over the mountains to finish back on the Beijing city side of the hills. The first climb is fairly tough, but we think it’s worth it – the views in the mountains and in the river valley are super scenic. Yinmeng Temple was first built during the Liao Dynasty (907-1125 AD), and was maintained by both the Ming and Qing. After destruction by shelling during the war with Japan, the temple was repaired again in 2009. Past the temple the trail crosses a gap in the mountains, and then a lovely little trail takes us down to the river valley. The first part of the descent is fairly open, and there are excellent views of the mountains further north. Later on, we pass through a birch forest before coming out by the river. Down by the river are the remains of a small settlement. We’ll make a little base here. Our plan is to explore a bit upstream first, and then follow the river downstream. After exploring upstream and doing a lunch break, we’ll walk on down the river. In most places it’s more like a stream. In summer, we’ll be able to cross over on the stones without getting our feet wet. In winter, we can walk on the ice! The river flows into the Longqingxia Reservoir. Longqingxia is a scenic area well known for the tall cliffs above the reservoir, and as we hike further down the river we’ll start seeing some of those cliffs. The water of the reservoir blocks the path out of the river valley, and the only way out is to climb back over the mountains. We cross over at another gap in the mountains and the views open up, with broad plains in front and more mountains further away. From here the trail is easier, following gentler slopes and ridgelines before taking us out through a small gorge to finish. Once we’re down into the river valley, the only way out is to climb back over the mountains. You have to finish it. No shortcuts! 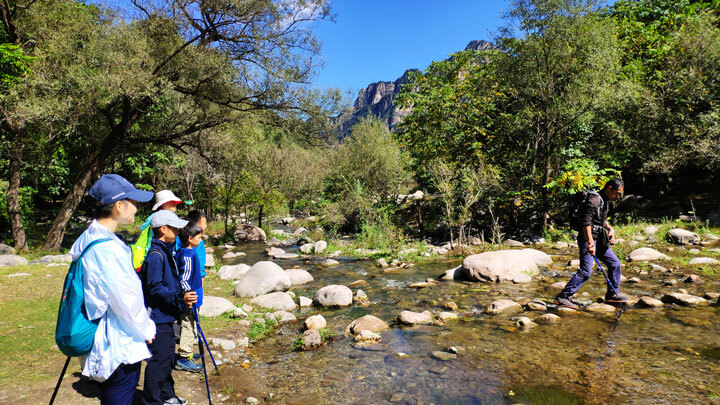 See 17 photos from the hike up to Yinmeng Temple and then down and along the Sujia River—riverside views and greenery, and a few photos from the temple. 25+ photos from our hike over the Yudu Mountains and down the Sujia River, including a visit to Yinmeng Temple.